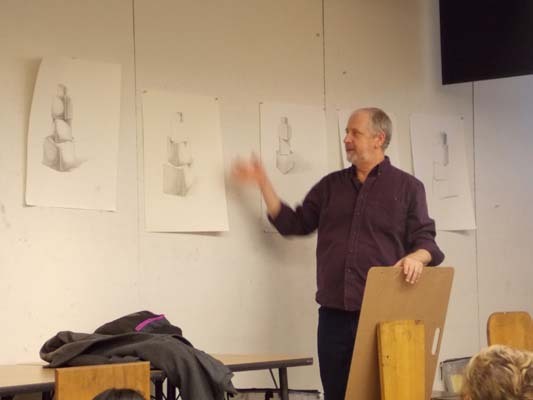 Whether you love to draw or cringe at the idea, Robert Hawkes promises you can learn from the drawing classes he teaches at the Visual Arts Center. Hawkes has taught Drawing I, II, III and IV at the college since 1988. Rembrandt remains his mentor. The 15th century Dutch painter and etcher conveys a humanness with his work that fascinates Hawkes, who stresses he doesn’t want to be Rembrandt, he wants to learn from him. Fascinated by the ink Rembrandt used, Hawkes began making his own following instructions from a 1597 volume titled “Book of Secrets.” He is particularly fond of the formula for an ink that requires crushing iron galls from an oak tree, mixing in cabernet sauvignon and adding other preservatives. By the time students have completed all four drawing classes offered at the VAC, they have a body of work with a theme preparing them for the self-directed art world. Hawkes earned his bachelor’s in fine arts from Virginia Commonwealth University and his master’s in fine arts from Ohio University. He taught at both schools prior to coming to TCC. Hawkes and his wife, Pam, reside in Williamsburg. In addition to drawing, he enjoys playing guitar while Pam sings at St. Martin’s Episcopal Church. They have one son, Ian, who is a student at James Madison University.